The Speak & Math (or Speak & Maths in some countries) was a popular and revolutionary electronic toy created by Texas Instruments in 1980. Speak & Math was one of a three-part talking educational toy series that also included Speak & Spell and Speak & Read. 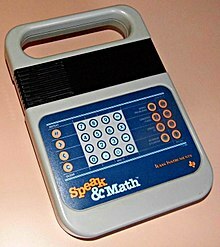 The Speak & Math was sold in both the United States and in Europe; it was originally advertised as a tool for helping young children to become better at mathematics. The Speak & Math had a distinct gray with blue and orange color scheme. The unit could utilize either 4 "C" batteries or 6 volt DC power adapter. The display resembled a vacuum fluorescent display, not unlike an LED display. The Speak & Math used a TI TMS5110 chip for voice synthesis. The Speak & Math, like the earlier Speak & Spell, also had the ability to expand its memory using expansion modules that plugged into a slot near the battery compartment. Speak & Math had five distinct learning games: Solve It, Word Problems, Greater Than/Less Than, Write It, and Number Stumper, all playable at three levels of difficulty. Solve It is the classic math problem-solving game where the participant must solve five math problems to the best of their ability. Number Stumper is a game of Bulls and Cows, whereby one is told the "number [of digits] right" and the "number in wrong place." Write It involves the participant typing the number they hear. Greater Than/Less Than involves whether the number on the left is greater than or less than the number on the right. This toy-related article is a stub. You can help Wikipedia by expanding it. This page was last edited on 17 September 2016, at 00:12 (UTC).